Hello Chengdu International Youth Hostel kohteessa Chengdu, Kiina: Varaa nyt! 3. 20% off when booking the Giant Panda Tour and Sichuan Opera Tour at the same time. 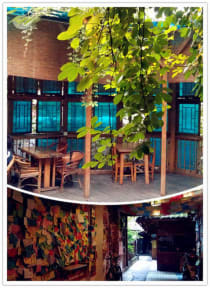 Former Sim's Cozy Garden Hostel; this used to be one of the best hostels in China. This is a fabulous space. We are always trying to keep this reputation. If lonely planet says so, clearly we are doing something right. Everyone works at the Reception, Travel Desk and bar speaks Chinese and good English. We have Japanese speaker as well. 2. Our restaurant provides Sichuan cuisine, authentic western food and some Japanese food. Our bar offers different types of wines and beverages. 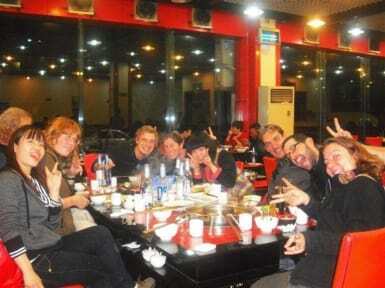 We provide the best travel information of any hostel in Chengdu, or even in China. There is a team, with English and Japanese speaker, with experienced travel advisers providing you with a professional service and all the information you need for traveling around Sichuan or China. We do not only provide for all our customers, also travelers staying in different parts of Chengdu come to get information and arrange your trips with us. -Open 09:00 to 22:00 every day. We do not only have two sweet gardens with different types of plants, but also in order to make our customers feel at home, we offer a range of fun activities as well as big festival parties...i.e. Christmas, New Year celebration, Spring Festival meals, Hallowmas party etc. Other activities like BBQ evening, outdoor movie, weekly quiz nights, table tennis and pool competitions. If lucky, we offer a variety of crazy drinking games which only increases the customers overall experience of their time at Hello Chengdu International (as well as a hangover). As you can see from traveler's recommendation on many of the travel websites, we are the most informative and experienced among many agencies when it comes to travel in Tibet. According to the demands of many travelers, we have set up a Tibetan travel counter. There are many staff specializing in arranging the trip to meet your needs/desires. Not only do we do this, but we will provide you with the best price and an unforgettable journey. The prices above are based on 4 -6 person group. The more people you have, the most reasonable price you will get. For more popular trips and more details, please contact us via email. We can hold more than 200 people and we are always busy with many travelers from all over the world. It is a great place to meet fellow travelers and easy to get more information for traveling around in the area, and also a great place to find traveling partners to share the cost for Tibet tour. -Heating system was upgraded! To keep you warm during your winter traveling, we have a newly installed hot water circulation heating system in our dormitory and private rooms. We are the only hostel in Chengdu with such a reliable heating system. Prices are as low as 40CNY for a dormitory bed and 90CNY for a private room. -Discounts on food at the restaurant when you give us some suggestions on our new Sichuan cuisine. -Discounts on movie tickets at local cinemas and at local restaurants when you purchase from us.